Hind Gut acidosis, often seen in performance horses, can lead to serious health problems such as laminitis or hind gut ulcers. But, what is this condition and how can we prevent it? Horses are known as hind gut fermenters, fibre is digested in the caecum by bacteria, fungi and protozoa which coexist in the hind gut. The breakdown of fibres produces volatile fatty acids (VFA) used by the body for energy. Hind gut acidosis occurs when there is a sudden drop in the pH level of the caecum or colon. Over consumption of high starch concentrates or high sugar grass pastures can result in an increase in acid levels which in turn lowers the pH. How is hind gut acidosis caused? There can be serval contributing factors to the onset of hind gut acidosis including a high starch and high sugar content diet. These pass through the digestive tract not fully digested, once in the hind gut the fermentation process creates higher levels of lactic acid and VFA’s to compensate for the larger digesta content. The higher acidic environment is unfavourable for the “good” microbes that live symbiotically within the hind gut. The optimal environment for bacteria is between 6.5 and 7.0, below 6.0 and the fibre digesting bacteria become less effective and begin to die off, releasing endotoxins. Damage occurs to the intestinal mucosa, where these endotoxins are absorbed leading to an inflammatory response, which can result in laminitis. However, the lactic acid producing and utilizing bacteria thrive off the lower pH levels, consequently resulting in a higher production of lactic acid, lowering the pH further. How to reduce the risk of hind gut acidosis? A few simple steps can be taken to reduce the risk of hind gut acidosis, as it is more common in performance horse, it is important to consider your management practises. 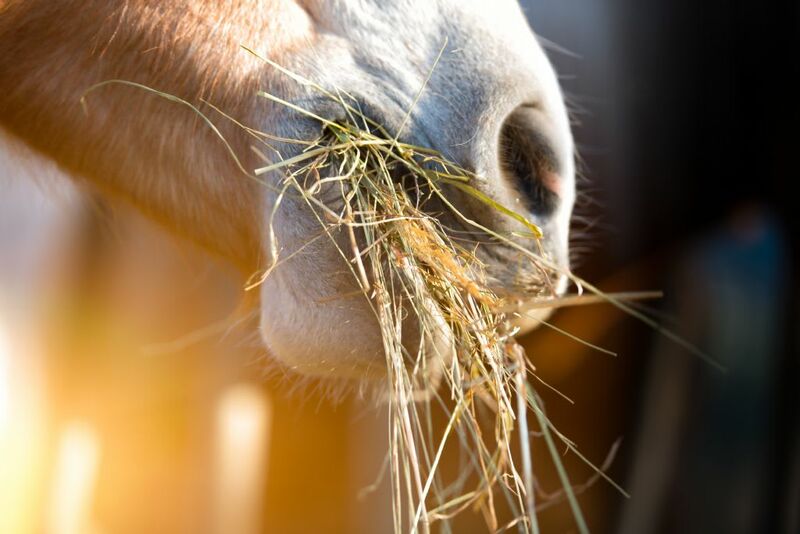 Provide an adequate forage content in the diet, it is recommended to provide a minimum of 1.5% of the horse’s body weight per day in forage. Increasing the fibre content will promote the “good” microbe population. Reduce the starch content of the diet, try to feed less cereals and use alternative energy sources such as super fibres and oils. Bluegrass Horse Feeds have a range of feeds specifically formulated with lower starch levels. Using grains that are micronized or extruded, this will increase the digestibility of the grains, resulting in a higher nutrient viability for the horse. For horses suffering or suspected of hind gut acidosis, Bluegrass Horse Feeds Re-Leve is a low starch, low glycaemic mix designed to help control the acid levels and promote gastrointestinal health through high quality vitamins, minerals and yeast cultures. For further information on how to feed horses with hind gut acidosis, fill in our diet form to receive a tailored diet plan from one of our expert nutritional advisors.